The items were wrapped well and very easy to put together. Very high quality. The wood is a deep cherry color. 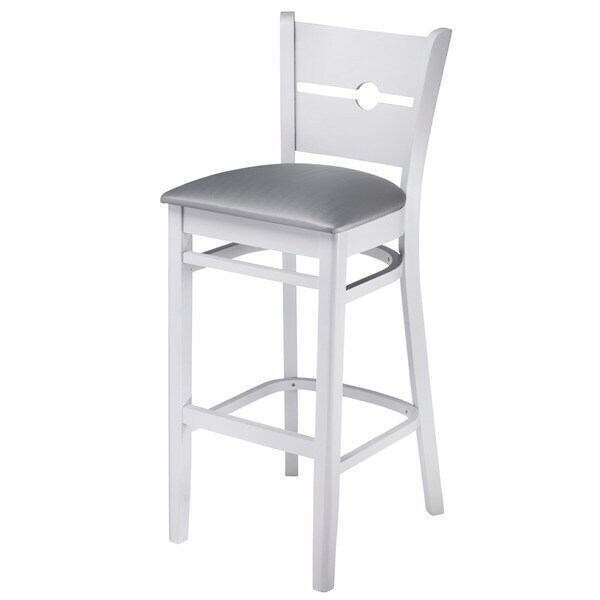 Add a touch of style your kitchen with this bar-height stool. This dining room furniture is constructed of solid Beech wood with a classic finish and features a faux leather seat. I got 5 of these for a kitchen bar. The cabinets are weathered black and these look really good. Very comfy seats and the backs are stylish. Bar stools are fantastic. In the age where furniture bought on line needs assembly -- this came without the need of having to put it together. What a plus! Order was received quickly and arrived in perfect condition. Have received numerous compliments. I am a repeat customer and will continue to be loyal to OVERSTOCK. These chairs are stylish and well made. I bought these chairs for my basement bar. They are very comfortable and look so nice. I was lookinfg for something with a higher back and so I will not be able to use them for this purpose. I like them so much however, that I decided to keep them and use them somewhere else. Very nice for the price. "In the picture, the white chair looks like it has a gray cushion but the options say it’s a cream cushion. Could you please clarify cushion color on the white chair? Thanks "
According to reviews, and being a 5 star sounds like a good deal in the quality of how they are made. Looks pretty sturdy. Can't wait to get them! "what is the height floor to seat?" The height of the barstool, floor to seat is 30 inches. "Is the seat 43 inches off the ground or is the height of the whole chair 43 inches?" The chair itself is 43 inches tall. It is the entire height from floor to top of the back. Whether you're snacking at the kitchen counter or sipping a drink at your home bar, your bar stool height should let you sit comfortably. Bar Furniture Buying Guide from Overstock.com. Here are tips to help you buy the right bar furniture for your home and your lifestyle.